The Steamin Demon boasts three times the soil extraction in half the time and up to FOUR times the water flow of a traditional content. All for a fraction of the price. We're proud to be paving the way for a new standard in the industry. Steamin Demon Inc. was established in the year 1995 by Mr. Mike Downey in a small town on the Ohio River called Clarksville, Indiana. Mike had just finished with his design and build of an ingenious lightweight commercial carpet cleaning machine that he decided to name the Steamin Demon. This industrial steam cleaning machine which utilized the patented high-flow extraction cleaning technology that he had just developed. The origin of the name, you ask? The Steamin Demon’s namesake was a world champion harness racer from the 1950s. The Downey family has been providing leadership and innovation in the carpet cleaning industry for five generations. The predecessor of the Steamin Demon industrial steam cleaner was called the Steri-Steam, produced by Mike’s father, the late John M. Downey III, in the 1970s. He was a prominent entrepreneur and businessman in Columbus, Ohio and the owner of John M. Downey Carpet Cleaning which was originally established by his father in 1897, and still thrives in Columbus today. Want more details about our company? Don’t hesitate to contact us with questions! It was there while working in the family business in the mid 1990's that Mike began working on ways to improve the performance of their company's steam machine, the Steri-Steam. He first redesigned and improved the vacuum system and then he added a unique on board pre-spray system. Later he began experimenting with increased water-flow rates and found that a higher flow rate substantially increased the amount of soil removal and significantly improved the overall performance of the machine. He then applied for and received an exclusive patent for his high-flow concept and it was soon after, the Steamin Demon Company was born. The high flow carpet extractors rival and exceed the performance of larger and more expensive truck mount carpet machines. Since the company's inception, Mike continued to refine and expand his original product design which now includes a line of three hard working portables. The SD-15 and SD-20 are both recent innovations designed primarily for the commercial carpet cleaning industry and the SD-Classic, Mike's sleek looking original design which is ideal for both residential and commercial carpet cleaning. 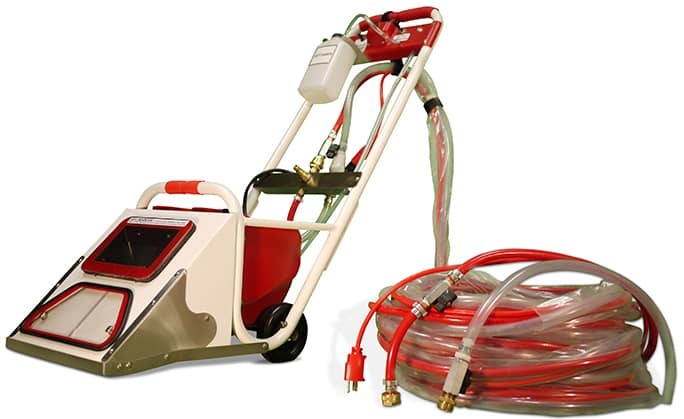 Carpet Cleaning Industry and now the Steamin Demon line of high-flow extractors have set a new standard for quality and performance in the manufacturing industry as well. I own and use a Steamin Demon and brag about it to anyone who is interested. I just did a 15,000-sq. ft. job at a Dallas Country club using the Demon and did it under the time allocated. I also did a 10,000-sq. ft. office area in August and it worked very well on white olefin carpet. The Steamin Demon filled and cleaned beyond our expectations. We have had numerous customers tell us that they have spent many $’s on carpet cleaning from van mount units. They say they never clean as well as our Steamin Demon cleans their carpets. We are cleaning 30-50 apartment units a month, plus insurance restoration, water and fire jobs. With daily clean up and of equipment we are totally satisfied and have had very little maintenance of this unit.